Make the perfect loaf of light and soft muffaletta bread with this super easy recipe. Stuff this bread with olive salad, sliced deli meat, and cheese to make an authentic New Orleans sandwich. It will be a real crowd pleaser at your Super Bowl party or family dinner! Place the flour in a large mixing bowl, then add the salt and yeast on opposite sides of the bowl. Stir each one in with your finger. Be careful not to let the salt touch the yeast directly, as it can kill or stunt the yeast. Add the sugar, oil, and half of the water. Stir with your hand until the dough begins to come together. Keep stirring and gradually add more water until all the flour is picked up and a sticky dough forms. Turn out the dough onto a floured surface and knead for about 10 minutes, until the dough is no longer sticky and passes the windowpane test. Check the dough by stretching a lump of dough between the thumb and forefinger of each hand. If the dough is translucent in places without breaking, it’s been kneaded enough. If it breaks, knead a minute longer and check again. Pour about 2 teaspoons of olive oil into a large mixing bowl. Shape the dough into a ball and turn it in the oil to coat, then cover the bowl tightly with plastic wrap and let it prove at room temperature until at least doubled in size, about 1 1/2 hours. Once the dough has doubled in size, punch it down with your fists to get rid of the air pockets. Place the dough on a large, lightly floured baking stone or cookie sheet. Shape it into a flat disc about 9 inches in diameter. Spritz the top of the loaf with a little water and rub it into the surface. 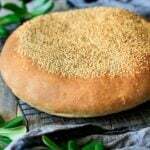 Sprinkle about two tablespoons of sesame seeds onto the top of the loaf and gently press them into the dough. Loosely cover the loaf with a piece of plastic wrap, and let it prove at room temperature until almost doubled in size, about 1 hour. Once it’s proved, the dough should spring back quickly when gently prodded with a fingertip. About 10 minutes before the loaf is done proving, preheat the oven to 425 F.
Remove the plastic wrap and bake the proved loaf at 425 F for 10 minutes. Lower the temperature to 400 F and bake for another 15 minutes, until the loaf is a rich golden brown and has an internal temperature of 200 F.
Let the loaf cool for at least 30 minutes on a wire rack before slicing.